There's a new blowout bar in town, and it's pretty darn amazing. Or, as Rachel Zoe would say, it's BANANAS. Why the Rachel Zoe reference, you might ask? 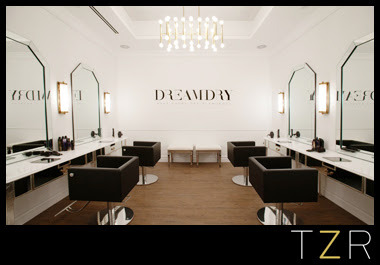 Because DreamDry, this fabulous new salon, is her creation! DreamDry is exquisitely designed. The space is created in sleek, chic black and white. Each blowout station is more than adequately sized, so you don't feel like you're on top of the person getting a blowout next to you. And the entire salon is deceptively large -- there are so many blowout stations, and the washing stations are tucked into a corner in the back. (Side note: The washing stations have some EXTREMELY comfortable armchairs to relax in while your hair is being washed and conditioned to perfection.) I also love the reception area, which is festooned with a black and white zigzag floor and luxuriously plush velvet couches. The Braid: neat or messy, it's your choice! The Blowout ($40): Your typical treatment, which includes a shampoo, scalp massage and blowout. Express Style ($30): A dry style which refreshes your hair at any time of day. No washing, just a light dusting of dry shampoo. Braids & Ponys ($20): Dry style only. Pinup ($40 with wash, $20 without): Any updo. Little Ones ($30): Blowouts for girls 10 and under. Amazing, huge, GORGEOUS curls that lasted throughout the night and into the next day with barely any hairspray! This was definitely one of my favorite salon experiences from start to finish -- everyone was so friendly and accommodating, and I walked out with unbelievably gorgeous hair! As Rachel Zoe would say, I DIE. For more information about DreamDry or to book an appointment, visit dreamdry.com.